Science fiction medicine doesn’t get much better than what’s offered onboard Star Trek’s USS Enterprise. Beamed up to the ship with a gaping phaser wound, the patient is sent to sickbay, where “Bones” McCoy directs a handheld device emitting a ray of light onto the injury. It shrinks and vanishes in seconds, leaving not even the trace of a scar. It may not work so fast or so perfectly, but the technology of light medicine is already with us. 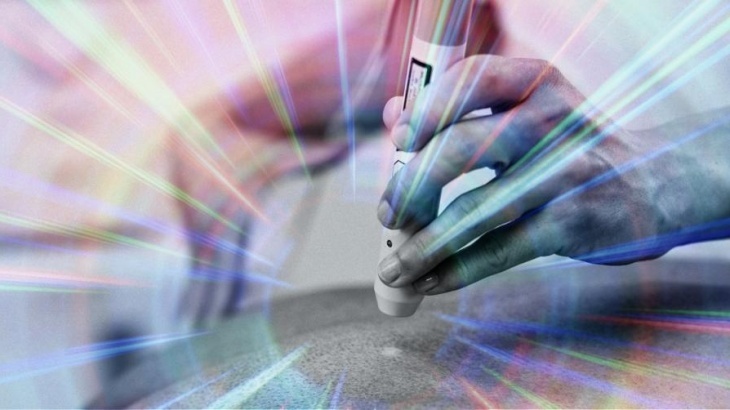 Called low-level laser therapy (LLLT), it has been used by some cutting-edge practitioners for decades, and the field is advancing at lightning speed. The research behind “photobiomodulation” (PBM), as this field is referred to, has grown to a base of thousands of studies, with more published daily: light for wound healing, for muscle and joint recovery, for shingles and nerve pain, for macular degeneration, Parkinson’s disease, spinal cord and traumatic brain injury, stroke, depression, and acne, to name a few. In clinical practice, light therapy still falls largely out of the boundaries of mainstream medicine, but the number of practitioners using the tool is growing with the list of conditions they are using it to treat. tissue in surgery and ‘bili’ lights to treat newborn babies with jaundice, for example. But there are many different wavelengths of light, and these, in different intensities, applied for different lengths of time, can encourage or dampen different functions at the cellular level. Some wavelengths of light at low-power intensities, for example, have been shown to induce photochemical reactions in the body, like photosynthesis in plants. It’s these harmless wavelengths of light in the red and near-infrared spectrums that are the tools of LLLT. Because the light doesn’t generate heat, it is also sometimes called “cold laser therapy.” More recently, researchers have begun investigating high-intensity laser therapy or HILT, also known as laser heat therapy. One in three Americans experiences chronic pain each year. It’s the most common reason that people visit their doctor, and muscle and back pain is the number one reason that people miss work or school. Mainstream medicine generally responds with steroid injections, nonsteroidal anti-inflammatory drugs (NSAIDs) and other painkillers with cumulative and potentially lethal side-effects. Some people are sceptical that one treatment tool can impact such a diverse list of diseases. However, certain wavelengths of light work at a cellular level, common to many diseases. It turns out that the mitochondria, the energy producers of the cells, contain molecules that act as photoreceptors (light receptors, like those found in plants) and respond to certain light wavelengths. In disease and stress, some systems in the mitochondria become overwhelmed, like those that defend them against oxidative stress. Receiving red light in their photoreceptors provides a shot of energy to the system, which allows the mitochondria to reduce oxidation, synthesize new proteins, and complete other maintenance functions that increase their performance as energy producers. Ronald Hirschberg, a veterinarian from Brockton, Massachusetts, had chronic pain in his hands from arthritis. After years of performing surgery for several hours at a time, he found he had to cut his schedule. Cold lasers have revolutionized the treatment of sports injuries in the past decade, and handheld light devices are now in routine use among elite athletes. Because PBM reduces short-term inflammation and pain, it is used to help athletes minimize downtime. Light therapy was first introduced in attempting to heal smallpox and tuberculosis lesions, and assisting with wound healing is still a major application of the technology. Several recent studies have found that LLLT can assist in wound healing. A 2017 study from the University of Ljubljana in Slovenia looked at 40 non-diabetic patients and 39 diabetic patients, all referred to the university medical centre with non-healing chronic wounds between 2012 and 2014. The patients were randomized into two groups receiving either true or sham phototherapy, three times a week for eight weeks. A double-blind, randomized, placebo-controlled study from Brazil compared diabetic leg ulcers in two groups of 14 patients—one group treated for 90 days with one percent silver sulfadiazine cream (the standard therapy) and “placebo” phototherapy twice per week, and the other group treated with real LLLT. Because it reduces oxidative stress and stimulates the body’s innate healing responses, light therapy has become a research interest for scientists seeking to repair devastating spinal cord and traumatic brain injuries. Several research teams, including Michael Hamblin’s at Harvard Medical School and Massachusetts General Hospital, are also looking at the impact of light on the brain. Transcranial photobiomodulation, where light is directed at the brain, has been shown to improve cognitive ability in both healthy people and those with dementia. Researchers are testing light-emitting helmets or “brain caps” that patients wear on their heads and intranasal light delivery for use at home. There are significant hurdles to overcome before light therapy reaches this hopeful end, but dawn for a promising non-chemical approach to medicine is breaking. Phil Harrington, of Franklin, Tennessee, a physics teacher before becoming a chiropractor, started using LLLT in his practice in 2005, mostly in patients who had pain associated with joint replacements. “Even if their surgery was ‘successful,’ ” he says, “people would have residual pain and lots of scar tissue. Laser is great because you can use it directly over metal implants.” Patients of his reporting pain of eight or nine on a scale of one to 10 say their pain went down to a two after a single LLLT treatment. Harrington was so impressed with the technology, he sold his practice in 2007 to focus solely on spreading the word about light therapy through the company K-Laser. “In my role now, I communicate with doctors all around the world who are using therapeutic lasers,” he says. “They are treating literally everything from head to toe—headaches, Bell’s palsy, neck pain, carpal tunnel, sports injuries, arthritic knees, plantar fasciitis and much more. Finsen was a big champion of sunbathing, too, and his Swedish compatriot Auguste Rollier launched some of the first ‘sanatoriums,’ where the chronically ill were treated with exposure to high-altitude sunlight and fresh air. These hospital/spas were copied around the globe until the end of World War II, but then the use of light as a vital and powerful healing therapy fell out of fashion as the pharmaceutical revolution in medicine dawned. The next big break in light therapy came in 2001, when NASA, which developed light-emitting diodes (LEDs) to grow plants in space, reported they also had tremendous medical potential. LEDs increased cell growth by 140 to 200 percent in Petri dishes, and when used with hyperbaric oxygen, they decreased wound size up to 36 percent in rats. “LED produced improvement of greater than 40 percent in musculoskeletal training injuries in Navy SEAL team members and decreased wound healing time in crew members aboard a US Naval submarine,” the NASA researchers reported. The US Food and Drug Administration approved the use of LLLT and LED therapy in 2001, soon after the NASA study, but the swift uptake of use was primarily outside of pharmaceutical-based mainstream medicine. A study from the University of Heidelberg, Germany, a decade ago described 203 patients (90 men and 113 women) with beginning (“dry”) or advanced (“wet”) forms of age-related macular degeneration. A total of 193 of them were treated using LLLT four times over two weeks. Ten patients received mock treatment and served as controls. LLLT significantly improved vision in 95 percent of eyes with cataracts and 97 percent of eyes without cataracts. Vision and color distortion and spots were reduced, and patients with advanced degeneration showed less swelling and bleeding. Improved vision was maintained for three to 36 months after treatment, while the eyesight of the control group was unchanged. After LLLT relieved his arthritis pain, veterinarian Ronald Hirschberg (see main story) saw the potential of light therapy for his own patients. He uses his Thor Laser from the UK on a daily basis to treat dogs with osteoarthritis, before and after surgery to promote healing, for fractures, soft tissue trauma, corneal ulcers, earaches and non-healing wounds, and he typically sees 90 to 95 percent success with the treatment. This article was published in the December 2018 edition of What Doctors Don’t Tell You magazine. ALTERNATIVE HEALTH, ANTIINFLAMMATORY, ARTHRITIS, CELESTE McGOVERN, Chronic Fatigue Syndrome, LIGHT THERAPY arthritis, back pain, Bell's Palsy, chronic fatigue, light therapy, low level laser therapy, muscle pain. permalink.